Here are our prices, we do have some rules that must be adhered to when fishing on our lakes for the wellbeing of our fish and other anglers. Special Offer! We now do a Senior/Junior (under 16 ) shared ticket on both waters. Rod Hire Purchase an entire kit for £75 (Rod, Reel, Line, Leader, Snips, Priest, 5 Flys and Net). If returned in good condition, at end of session, a £45 refund will be given, otherwise it's yours to keep. Wheely Boat for our disabled anglers A wheelie boat (with electric outboard) is available, free of charge, to disabled anglers on both lakes. The lakes are covered by high power CCTV cameras and these rules are strictly enforced. FLY AND FLY FISHING TACKLE ONLY. ALL FISH MUST BE KILLED, NO CATCH AND RELEASE. Any fish landed under 2 pounds need not be counted towards bag limit, so long as the fish is handed in at the lodge on your departure. Only ticket holders are allowed to fish and only one non-fishing guest per angler. All cars to be left in the car parks. All fish are to be weighed and recorded at the lodge on leaving. Once the catch limit has been reached, another ticket MUST be purchased in order to continue fishing. Fishery staff hold the right to return foul hooked fish. No wading is allowed on the Lechlade water. Fishing on the river is strictly between the marked posts. No damage whatsoever to trees and wildlife. CLOSING TIMES may vary and will be displayed on the notice board. All boats must be paid for in advance. No more than two people per boat. All boats must be attached to a Buoy. NO DRIFT FISHING. Flies must be removed from the water while moving between buoys. On Bushyleaze no boats are allowed into Woodstock pool. Please ensure that all litter and fishing tackle is removed at the end of the day. Anyone found contravening any of the above rules will be required to leave and forfeit their catch and entry fee. They will not be re-admitted. 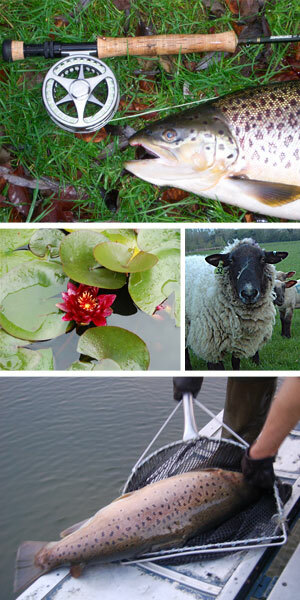 Fishery staff have the authority to inspect tackle, bags, other equipment and catch. DO YOU HAVE A ROD LICENCE?